There’s an old Chinese proverb that eating black-eyed peas on New Year’s Day will bring one luck in the new year. Oh wait, it’s a Southern thing. Mix garlic and serranos in a large bowl. Add peas and mash to a pulp. You can throw in the eggs at this point if it’s difficult. Once peas are mashed add eggs (if you haven’t already) ham, green pepper, onion, cilantro, salt and pepper and mix to incorporate. Add 3/4 cup bread crumbs and form into patties. Heat enough oil in a large skillet to cover the bottom f the pan and brown patties on each side, until crisp on the outside and warm inside, about 2 to 3 minutes per side. Garnish with fresh pico, or hot sauce and sour cream. Hankering for some more black-eyed pea recipes? How about black-eyed pea and ham stew? Jamie Anne over at A Dash of Domestic has this Texas Cavier. (Funny we always call it Cowboy Cavier, but we are one state over.) Judy over at The Southern Lady Cooks has some crockpot black-eyed peas or hoppin John. And check out the smokin’ hoppin’ john over at cooking-spree. This entry was posted in Dinner, Food, Recipes and tagged folklore, frying, holidays, southern, vegetarian. Bookmark the permalink. Well. I WILL be making these for sure this weekend, I have johns vegetarian (go figure) children staying and I bet I could make a vege version and an omni version of these.. excellent TASTY timing! Extra serranos in mine, please! Love the idea of serving black-eyes peas in cake form.. Are you making collards too? Yup, whoever gets to eat these cakes is one LUCKY winner! Oh my, it is my lucky day to be in your kitchen. Wondering what I am drinking! I am going to go and link to your delicious and spicy recipe post with my “cardboard self” in it right now. What fun! Those look good. Is that a salsa on top? These look good enough to eat every day! I was just about to look up leftover ham recipes. This is perfect, and I’m thinking the black eyed pea and ham stew may be on the menu for this weekend. Your timing is impeccable! Hello, I am a follower of flat Ruthie, and a fan of this post. For years my mother made black-eyed peas on the New Year. I only wish she was still with me to see this recipe today. Great pic and great grub. Thanks for both. Thanks for stopping by. Glad the post made you think of your mom. I usually find black-eyed peas a little meh, so the cake idea is intriguing. I suppose I’m gonna have to come up with some way to eat them soon, lest I have bad luck in 2012. I’ve definitely heard of having black eyed peas for New Years, but I’ve never tried it before. I think your version in a patty will be my entry into trying these out. And I know my kids will like them served this way. So…what’s the story behind the paper doll? Is that Katherine whom we’ve never seen before??? That’s our friend Ruth from Pittsburgh, who has a great photo blog, and is shipping her cardboard self around to see the world: http://cardboardmetravels.com/2011/12/30/cardboard-me-dines-in-arkansas/ We’ll actually show her the town, but we had to feed her first. I love this tradition! We have lentils in Italy, and hangovers in Spain so think we´ll be getting a good healthy dose of legumes to sort us out! Seriously, they look good…just need to get my hands on some Black Eyed Peas now! I wonder if black beans would be good this way, never tried it… We just like this because it’s a different. Although I’ve heard of Hoppin John for New Year’s, this is my first “cake” and I like the change. Say, Greg, besides lentils, are you aware of any other Italian traditions? Mom always gave us grapes and I wonder if others follow that tradition. According to Chica, hangovers in Spain are a great tradition. I’ve heard of grapes, but we never did it. The black eyed peas, definitely from Katherine’s family! We definitely had that tradition in our house even though I never acquired the taste for the beans! Fun to think of those memories — Happy New Year to you both! goooood idea! We always do Hoppin’ John, must add this to the New Year’s Day menu. Southerners unite! Don’t forget the hog’s jowl. Yes, our family always eats black-eyed peas on New Year’s Day, but never like this! Now I’m intrigued. Thanks for yet another idea, and Happy New Year! 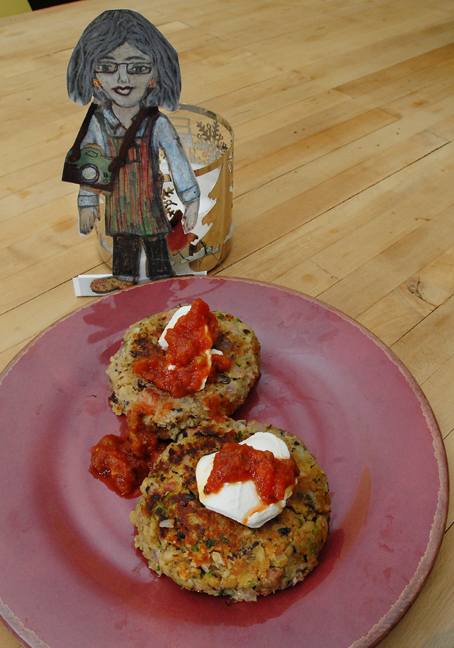 I love the idea of black-eyed pea cakes! I’m keeping it simple with just hoppin’ john and collards this year, but this is definitely bookmarked for next. Love the idea of the bean patty Greg and so would my crowd. Must try! Looks like no end to good luck this year. Thanks so much too for the link back! You’re welcome, I already had a few in there and would be remiss to not add yours. Thanks for doing the same. I should have noted this, one great thing is you don’t have to soak black-eyed peas. They cook super fast, like 30-45 minutes! Hope you like these, if you try them, and the mushrooms.Happy New Year! They sound excellent! I had no idea it was a Southern tradition. I hope they bring you happiness, joy and prosperity! you both should come on up to NY for newyears eve…and hand me that plate of black eyed pea cakes. Oh these sound great! Your surprise visitor makes them look even more fantastic. Sounds like a great NY’s tradition. Black eyed peas, I need one of these or two or three! Happy New Year! Greg (& Katherine) I’ve nominated you for the Versatile Blogger Award. I made a recipe similar to this a few years ago when we celebrated New Years day with friends that brought their children. I thought black-eyed peas in a fried patty might be accepted better than Texas caviar. The recipe I used originated in Africa…dried black-eyed peas are ground and used like flour. Your recipe sounds great and is much easier to prepare. My black-eyed peas are in my cupboard right now ready for tomorrow! I never thought to make a cake out of black eyes peas! Great idea. Happy new year!!! It’s more like a veggie burger, which needs a name like cake to be served in our house! We do too. She didn’t even touch her food! They are really beans, aren’t they? The cakes look wonderful and the spice combo within sounds delicious! Um, yes. They cook almost as fast as peas. Did Flat Ruthie bring a hostess gift? Just her sparkling personality and a sense of mischief… more on that later! Haha! I did a double-take after reading that. Chinese New Year isn’t for a bit, but in case you want to get ready now, serve a whole fish for good luck! Chinese and proverbs just sound better together! Nice cakes for a surprise guest. I love hot sauce to spice things up. Ingenious sounding recipe. I’ll take two. Never had this before but it looks and sounds good. Will have to try it.